Astitchworks Concepts (Fashion Sewing Institute - AFI) offers intensive sewing program of different visions of contemporary and traditional dressmaking courses for individuals, groups, and organizations. Our trainers are skilled in delivering traditional, interactive and experience. By guiding, supporting and integrating exercises and activities into the sewing program, learning takes place in a highly participatory manner. Attend our Institute, we provide the sewing program for advanced education in the fashion industry, we are taught to help learners reflect on their learning and develop learning skills and strategies to achieve their goals. Astitchworks believes the Better Ways is to share the knowledge and skills sincerely and treat all students fairly with positive benefits and good relationships with trainers and students. And, herewith are guidelines how Astitchworks runs the sewing program. In this hands-on role, we ensure that our trainers or staff will the necessary functions to ensure trained or satisfied students/service providers and provide high quality for all Education and Sewing Services. Liaise regularly with the Management/Coordinator to promptly report any concerns on program issues or feedback from students/customers. Our trainers/staff also are involved in professional sewing in a variety of garment sewing specialties beyond what is usually thought of as dressmaker or tailoring work including production sewing and other industry-related avenues. Better lifelong learning is a term we prefer at Astitchworks Concepts to describe the work or training we do that uses fashion, as a discipline, to drive change, build a sustainable future and improve the way we live. Our courses are taught by highly experienced tutors with exceptional levels of professional expertise and a wealth of subject knowledge. Through a wide agenda, which includes; social responsibility, environmental sustainability, awareness-raising, and collaboration, we encourage dialogue between staff, students, and our wider community to develop an understanding of how we can use fashion to create better lives for all. Here are a number of our projects, initiatives, and collaborations that reflect our belief in using fashion as a catalyst for change. Our primary goal is to provide quality fashion study opportunities and teaching support services. With our programs, it will give inspire participant to experience the joy of sewing and the satisfaction of fashion one vision. Astitchworks' founder is Jumiah Haji Ujud started teaching couture sewing classes out of her attic room on East Coast in 2003. She wanted to share all her sewing skills and techniques she had learned from her 30 years to these cities/other countries growing the number of dressmakers and designers. Word of these independently run classes spread, and what had started as a class in dressmaking, quickly expanded to numbers that outgrew her loft apartment. Since then, this has been the mission of the Astitchworks Concepts, starting from bespoke tailoring to progressively the sewing program that could include the skills for public needs to know to better navigate the fashion industry competitive environment. She believes that in order to effectively perpetuate her business from one generation to the next, she encourages a sense of extended family, Sadiq Dinarro and Nur Salinah to engage in developing the business. Furthermore, “Giving back,” a key value in successful family business, helps to support a philosophy of material importance. As founder and director, I hope our sewing program and services to inspire people to experience the joy of sewing and the satisfaction of wearing one vision. I welcome anyone interested in the education of fashion and sewing services to our Astitchworks Fashion Institute (AFI). We strive to reach everyone with an interest in personal productivity and increasing skills. Hence, we are improving our education skills standard to meet the student’s expectation in general, and will constantly revise and redesigning our sewing and craft programs. We apologise for any undue stress may have caused any learners. Your feedback is important that helps us to improve and be better in our services. We would appreciate, kindly show respect and cooperate if you want our trainer or management staff to solve your issue. And, we would like to thank you our respect learners/customers for their support and feedback about Astitchworks. Your generous support is critical to our success! Together we can build a better tomorrow! We understand most students joining Astitchworks with zero background or just having basic stitching. We teach students a zero angle to achieve student abilities for your future success. Keep In Touch. Sign up for AstitchWorks newsletter and keep up to date with us. 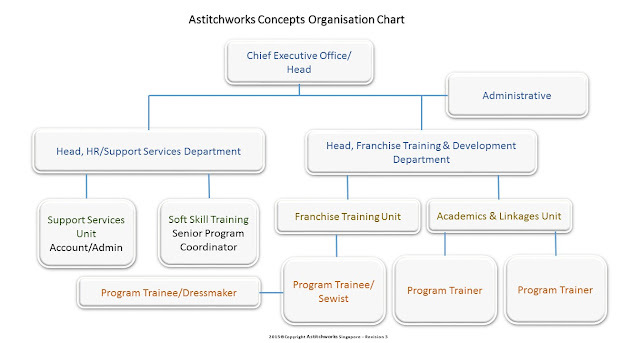 This website and its contents are subjected to and protected by copyright of Astitchworks Concepts. No part of this website can be reproduced and/or used by any third party without prior written permission.